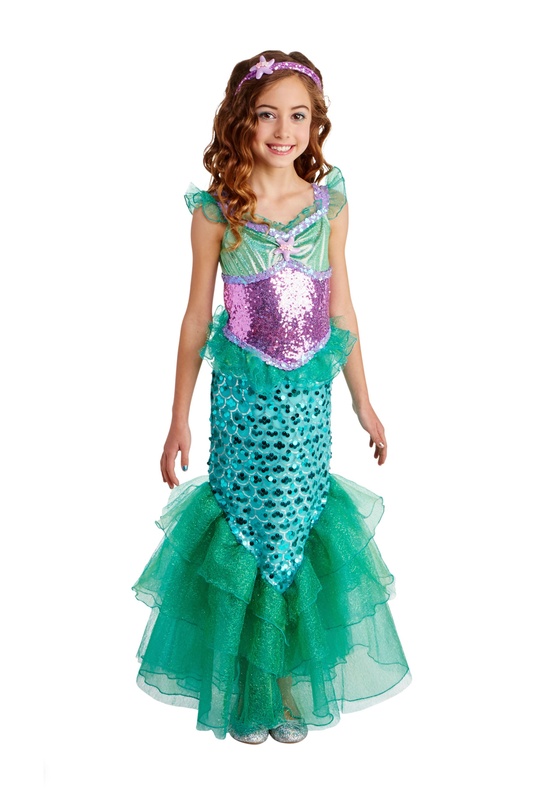 Blue Seas Mermaid Deluxe Girls Costume. The ocean is an amazing place with plenty of adventures to be had. Anything but monotonous, the life of a mermaid is endlessly fascinating for everyone young and old. On Monday a mermaid could explore ancient sunken ships with her fishy friends, discovering long forgotten Viking artifacts, uncovering chests full of gold and jewels. Tuesday she could hang out with a cohort of seals, discovering sea caves in the shallows, feasting on mussels and clams before diving back to the coral covered depths to sleep in her giant shell. There isn't any wonder why your daughter loves the magic of the underwater creature culture. Mermaids combine adventure and elegance in a way that no other creature can. They get to jump with dolphins and dive with the puffins. They are naturally dressed up with their sparkly tails with their beautiful fins. In this ensemble's aqua marine colors your daughter will love posing on rocks as if she's sunbathing in the middle of the ocean. Your princess of Poseidon will be ready to meet the deep sea courtiers with the sparkly purple bodice, turquoise top, and starfish detail. Let's not forget her fabulous tail, it has two different kinds of sequins for extra sparkle and layers of sparkly tulle that'll add plenty of drama to this seafaring gown. Whether she's the kind of mermaid who prefers singing on the seashore or exploring the depths of the ocean your daughter is sure to enjoy wearing this mermaid costume. She'll probably want to play pretend in the dress once the trick-or-treating is done, understandable, once you get a taste of the mermaid lifestyle it's hard to go back. This year make sure her Halloween goes swimmingly in this blue seas mermaid costume.